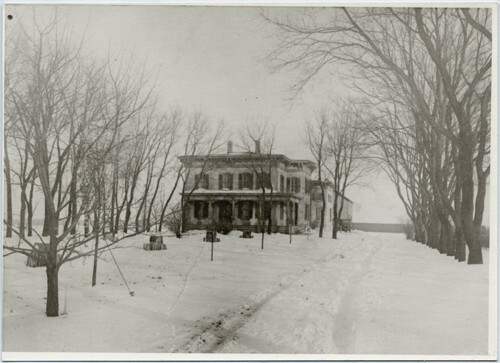 Fargo History Project » James Holes House, 1230 5th St. N.
James Holes home, circa 1915. Courtesy NDSU Archives, Photo 2093.40.26. The James Holes House is built in a style that was popular in the 1870’s called Italianate, which drew inspiration from late-16th century Italian architecture. The October 11, 1879 Fargo Times had a detailed write-up about the home, as its grandeur surely was a novelty to the some of the rough-hewn settlers of the prairie. “One of the handsomest and most conveniently arranged residences in Dakota Territory. The building is of brick, laid in double walls, with a three inch air space in between, making the wall 15 inches thick. A beautiful continued rail platform staircase at the end of the spacious hall connects the upper and lower floors. The cellar is an immense affair… containing over 2,300 square feet of space. A 200 barrel cistern in the bottom of the cellar affords an abundant supply of filtered water for the house. The whole affair was superintended by John Pray, formerly of Ogdensburgh, New York, who has had 28 years’ experience in the building of first class residences.”  Someone asked Holes why he built such a big house, and he explained, “to catch lots of rain water.”Following the death of James Holes, Sr., in 1916, his children, James Jr., and Marguerite, took over the family business concerns. Marguerite married Charles Finkle, and the farmhouse became the Holes-Finkle House, as it was known for many years in the community. As Fargo grew, Broadway was rerouted, changing the address to its present designation, the 1200 Block of 5th Street. The house remained in family hands for over one hundred years. It now stands oddly recessed from the street, remaining proudly among the newer, more modest single-level dwellings of its residential North Fargo neighborhood. “A Model Residence.” The Fargo Times, October 11, 1879. Johnson, Roy P. “Pokin’ Around in Your Home Town”, Fargo Forum, February 4, 1964.